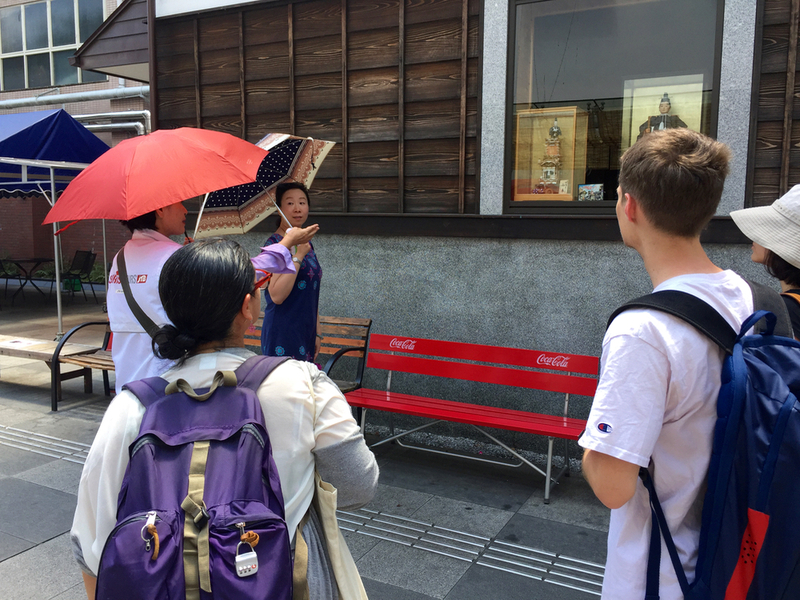 The third Tokyo Getaways tour we would like to share is the Walking Saitama with Street Food: Kawagoe ‘Ancient Edo’ Walking Tour. 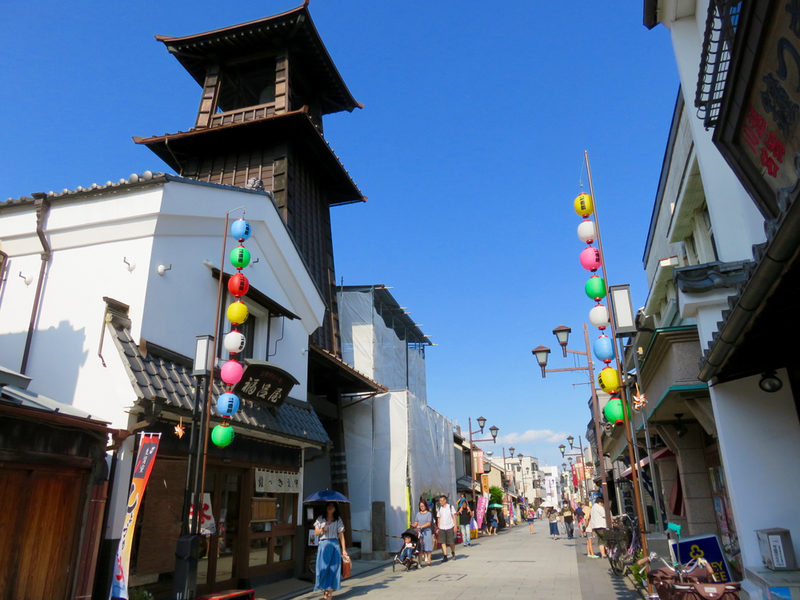 Kawagoe is approximately 30 kilometers from Central Tokyo and known as “Little Edo” after the old name for Tokyo. 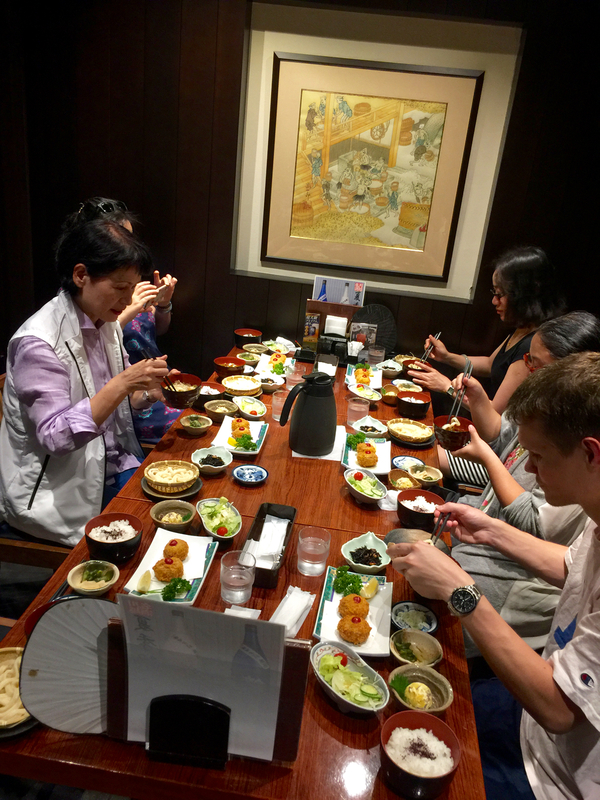 There was much to enjoy, including the many historical sights and local foods. 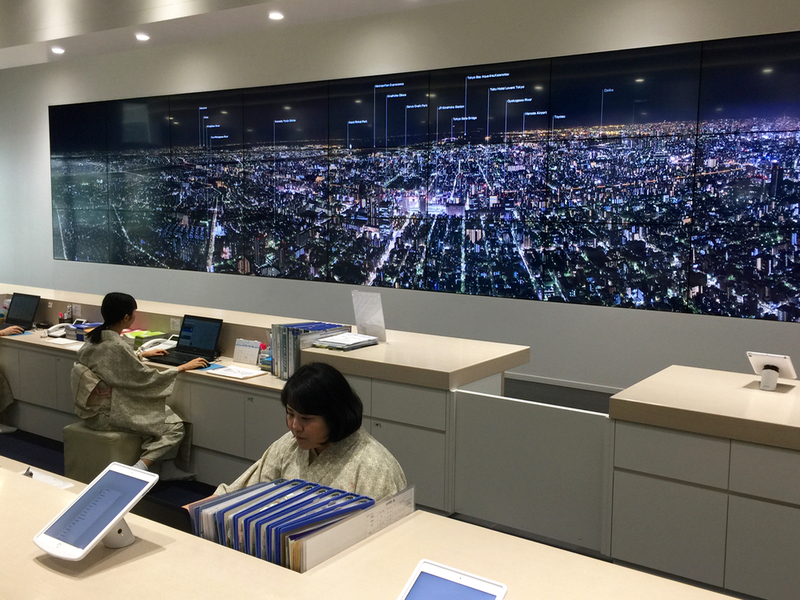 9:30am – The tour begins here at the Tokyo Tourist Information Center Shinjuku in front of Shinjuku Station. 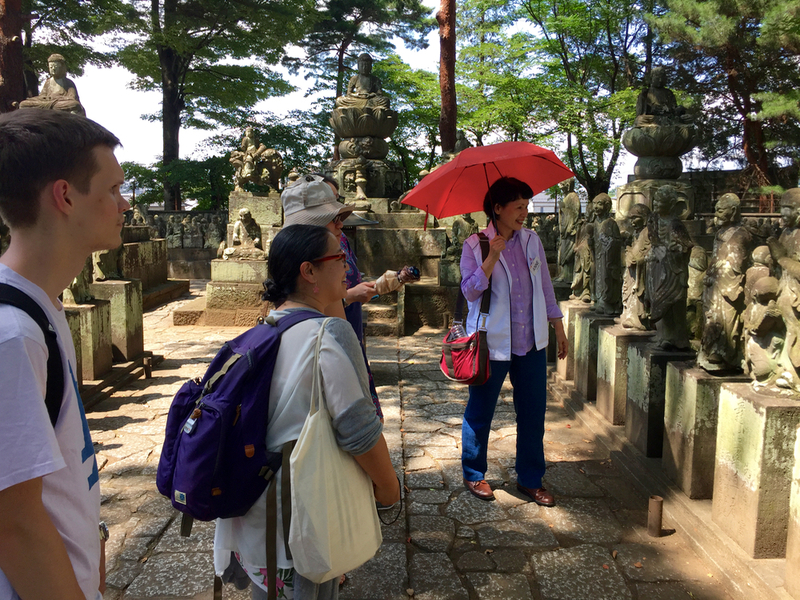 Participants from China and Russia joined the tour for the day. 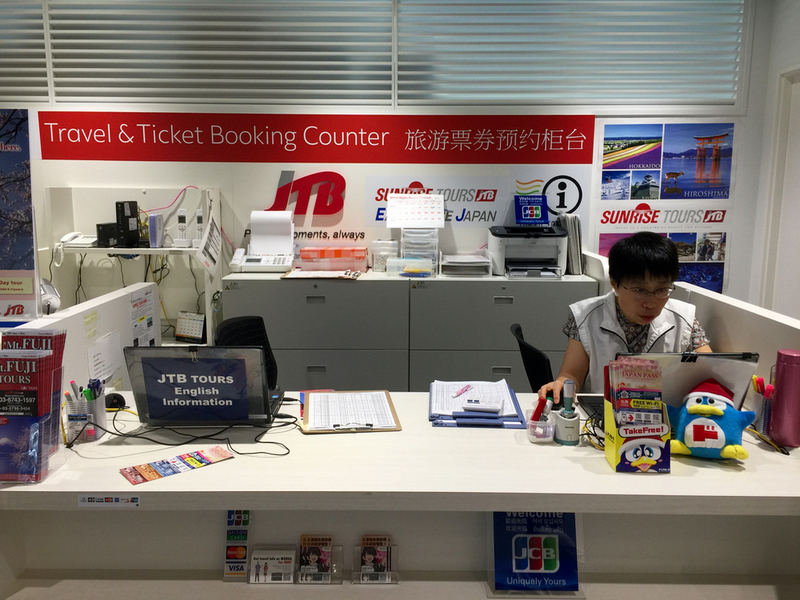 Our meeting place was inside the Information Center located right next to the bus terminal but we did not take a bus. 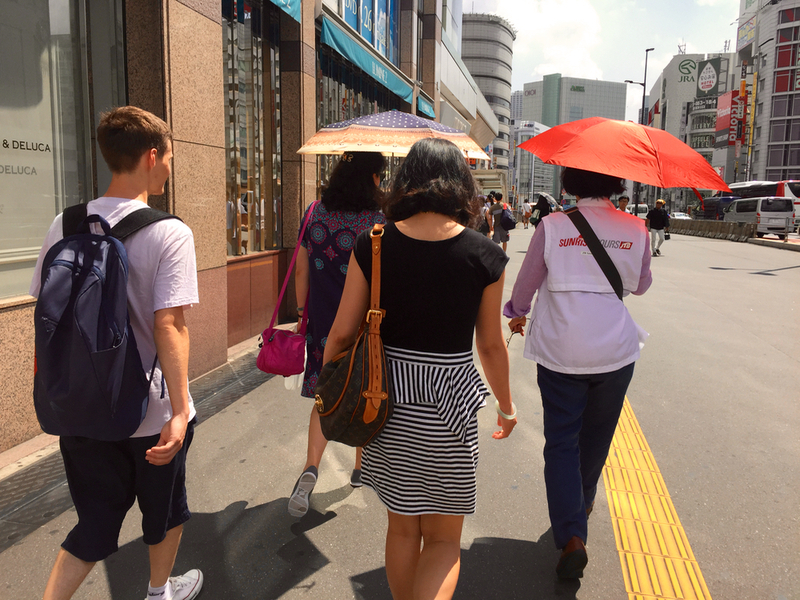 We instead began our tour by walking towards the subway station with Ms. Inuzuka, our tour guide for the day. 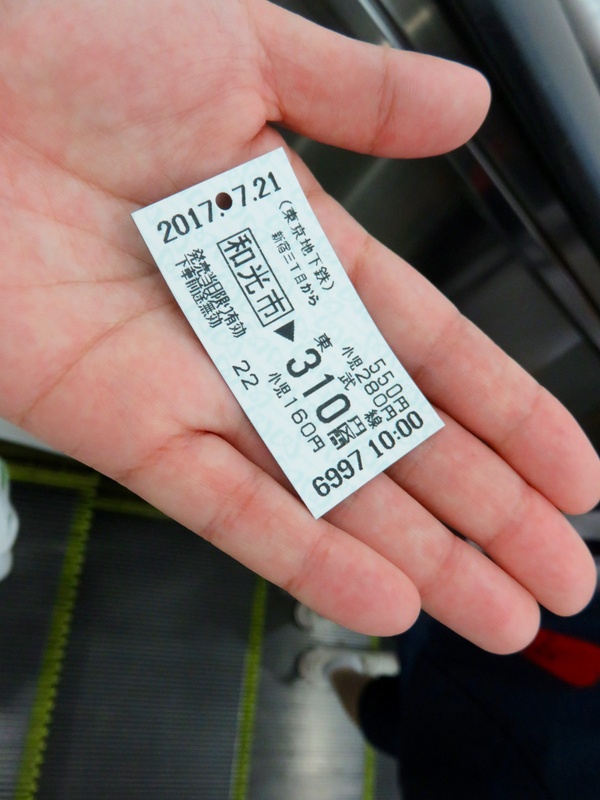 We took the Tokyo Metro Fukutoshin Line from Shinjuku-sanchome Station and changed to the Tobu Tojo Line towards Kawagoe Station. 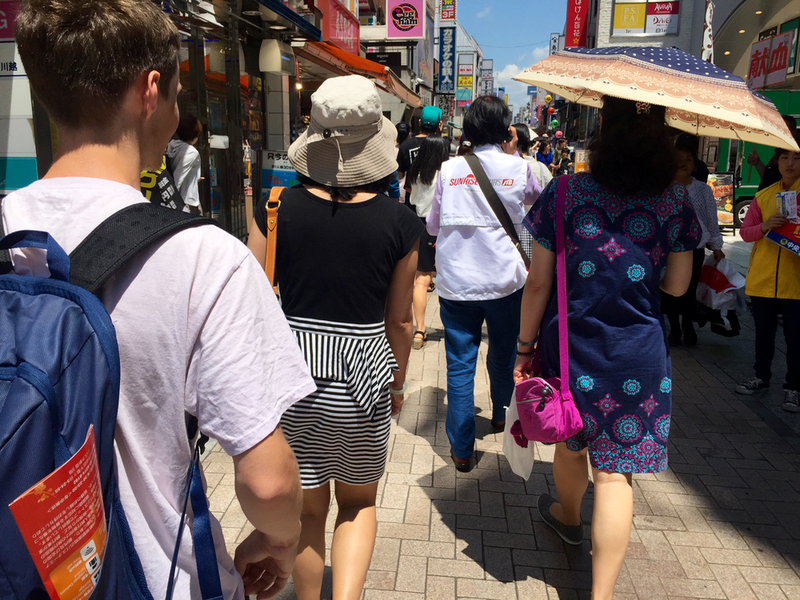 It was great being able to observe a part of Japanese daily life by using the public transportation system and yet still have the comfort of knowing that a professional tour guide with 20 years of experience was with us. 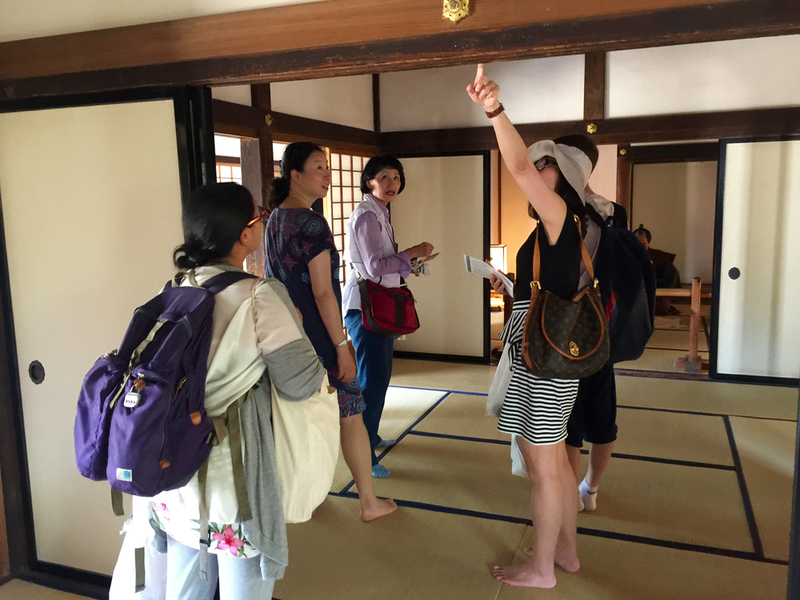 All during this time, we were free to relax or our guide was always there to answer any questions we had. 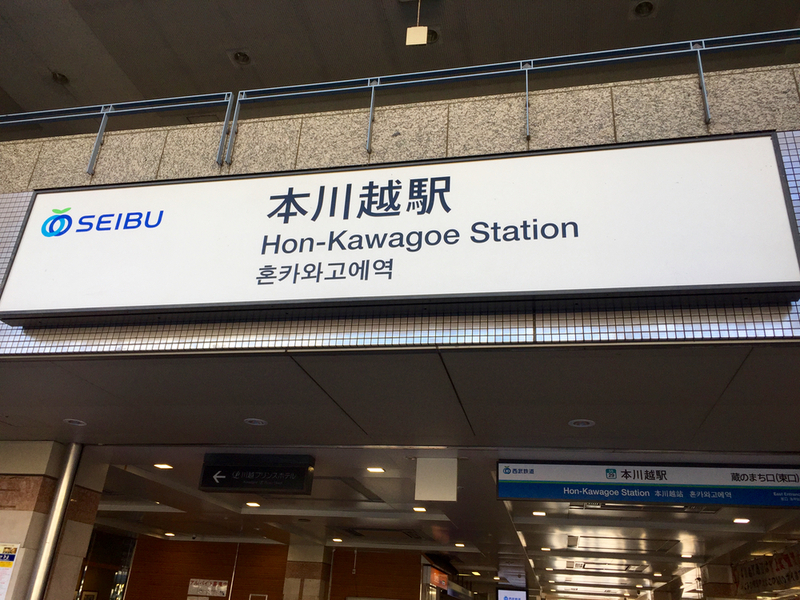 After about 50 minutes on the train we arrived at Kawagoe Station. 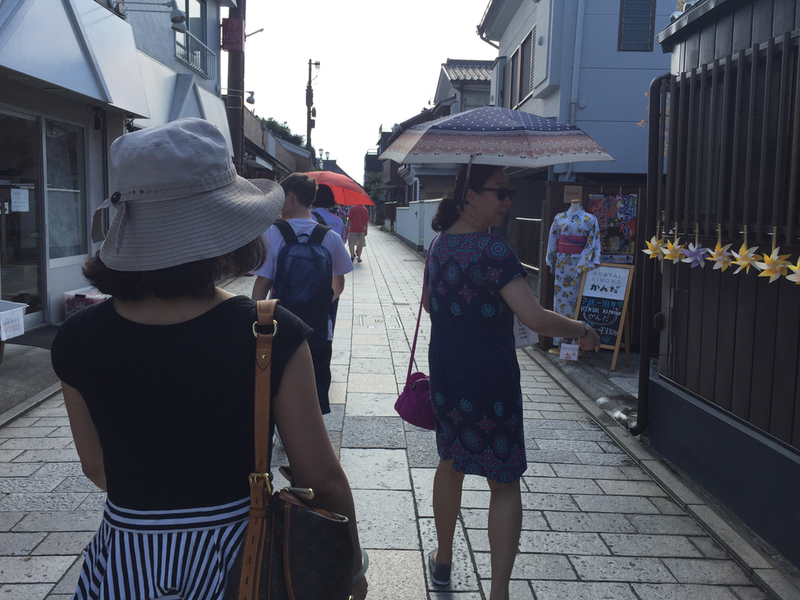 We walked through a shopping district occasionally stopping to learn about certain shops or areas. 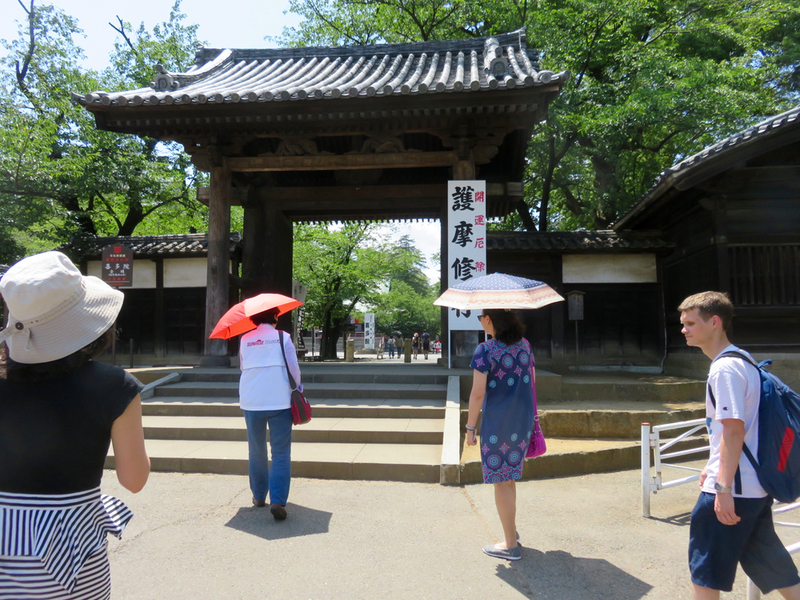 Since it was a hot day out, our guide was kind enough to lead us through more air-conditioned or roofed streets. 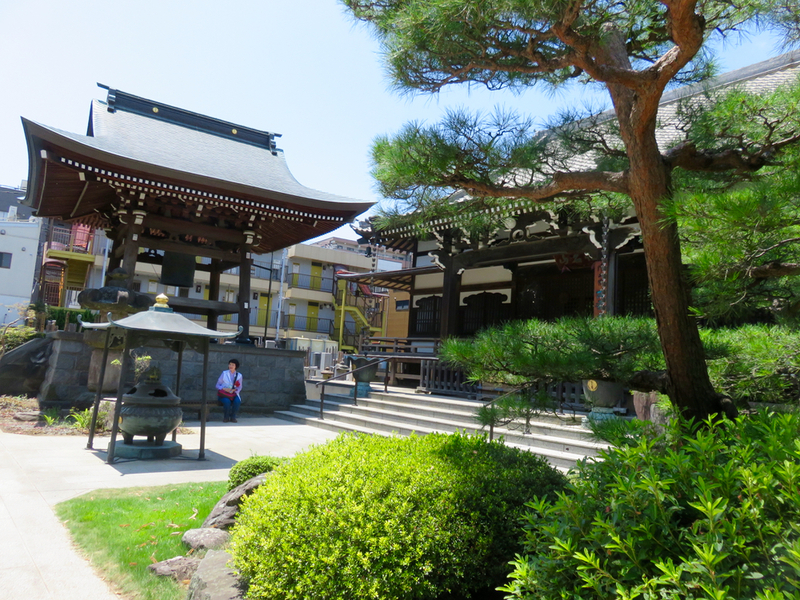 We made a quick stop at a Buddhist temple that is about 370 years old, located in the middle of the shopping street. 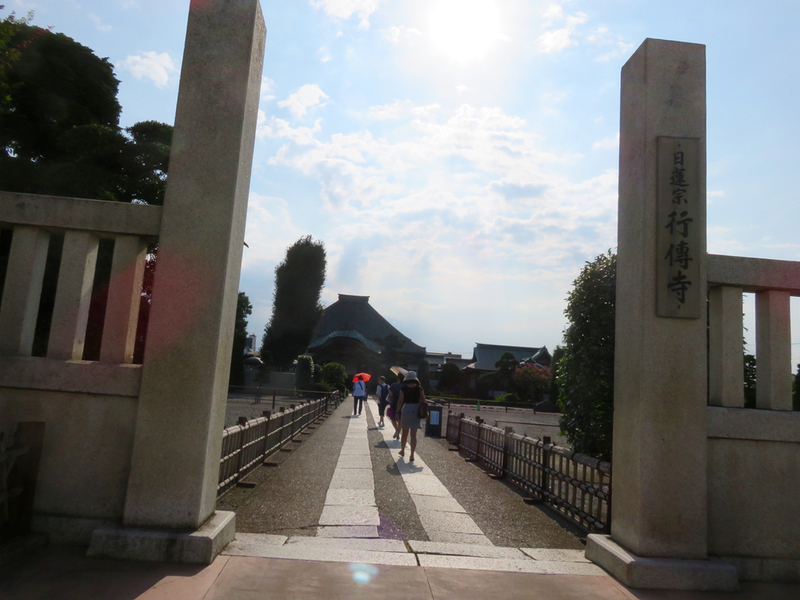 It was Saiunji Temple of the Jodo-shu, a branch of Pure Land Buddhism. 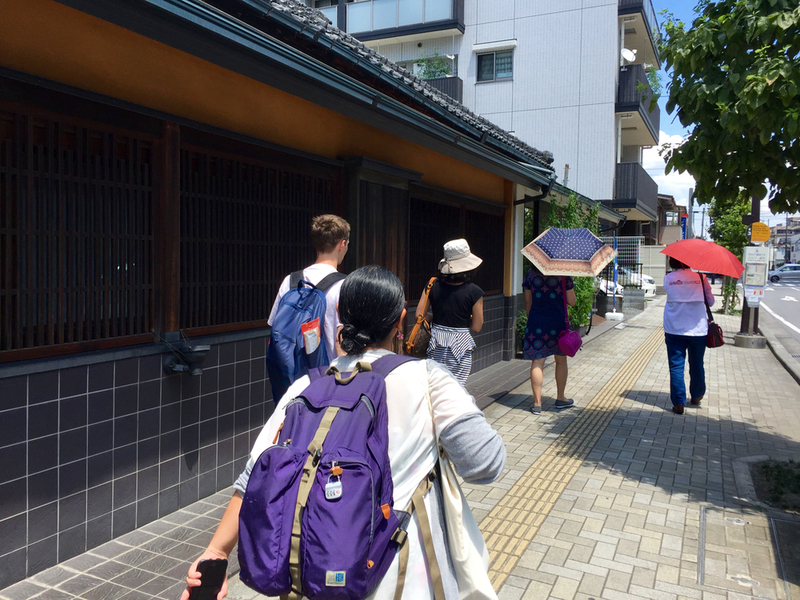 Following the visit to the temple, we continued to walk down the street. 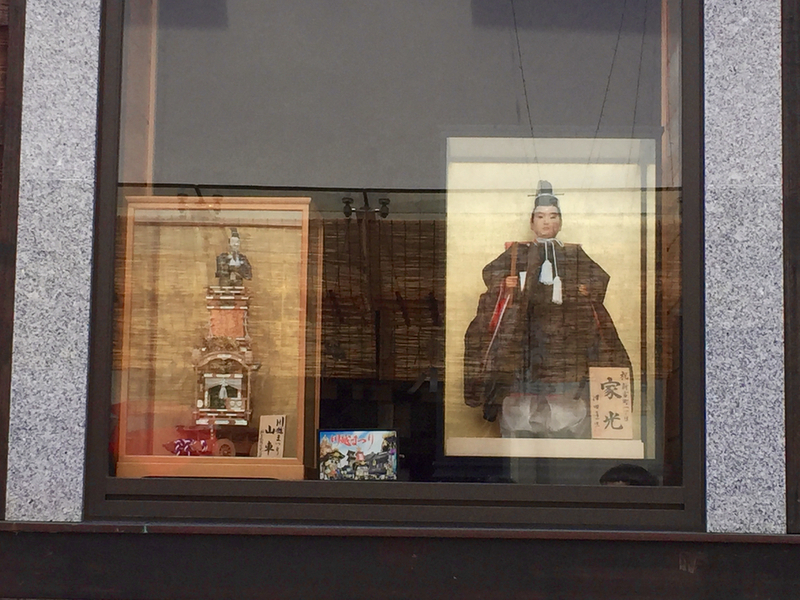 On the way we saw a doll of Tokugawa Iemitsu, the third shogun of the Tokugawa dynasty. 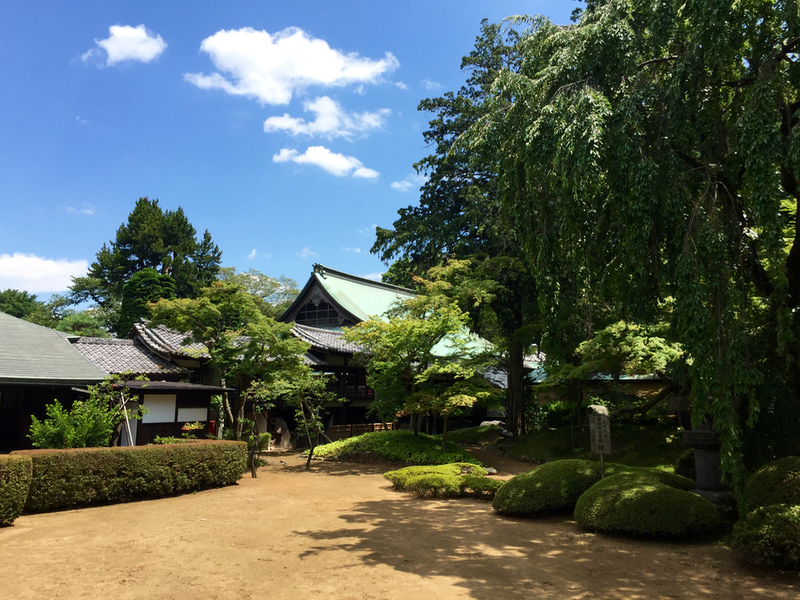 In Kawagoe there is a temple called Kita-in, which we visited later in the day, that has historic connections to Tokugawa Iemitsu. 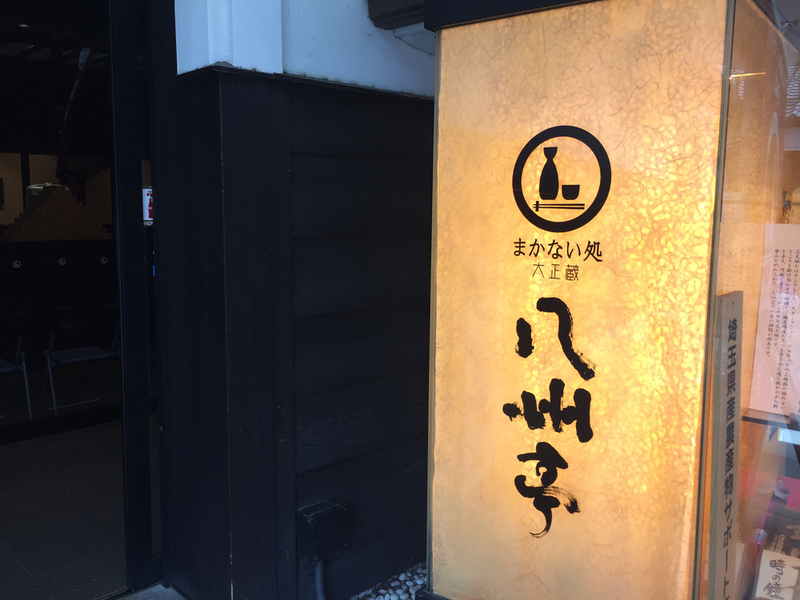 It was almost noon so we entered the restaurant Hasshutei where we already had lunch reservations. 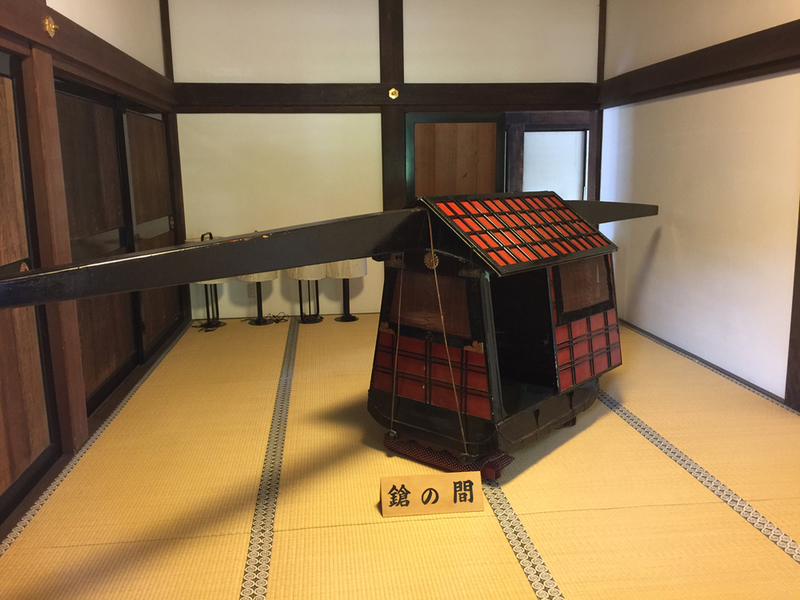 It was located inside an area called Koedo Kurari, a renovated kura (蔵) or traditional storehouse which now has a dining area and souvenir shop. 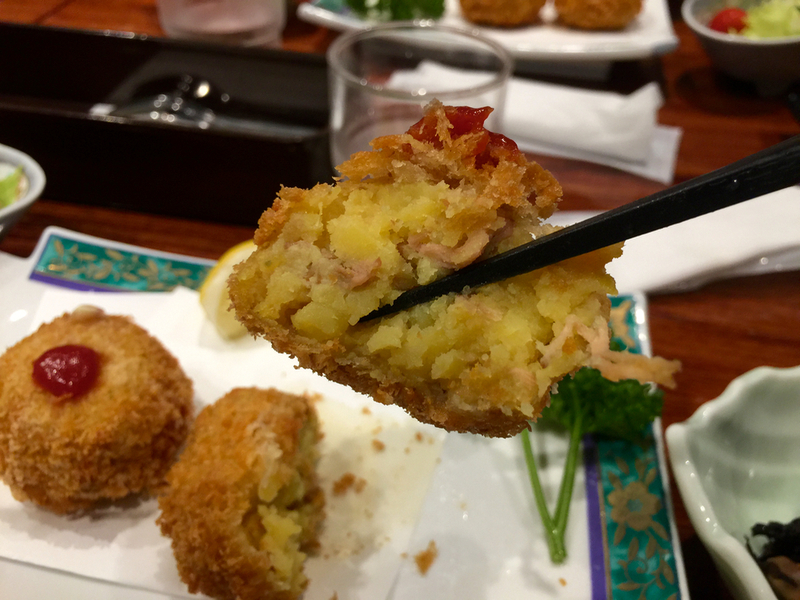 So much delicious food was served including croquettes made with sweet potatoes. 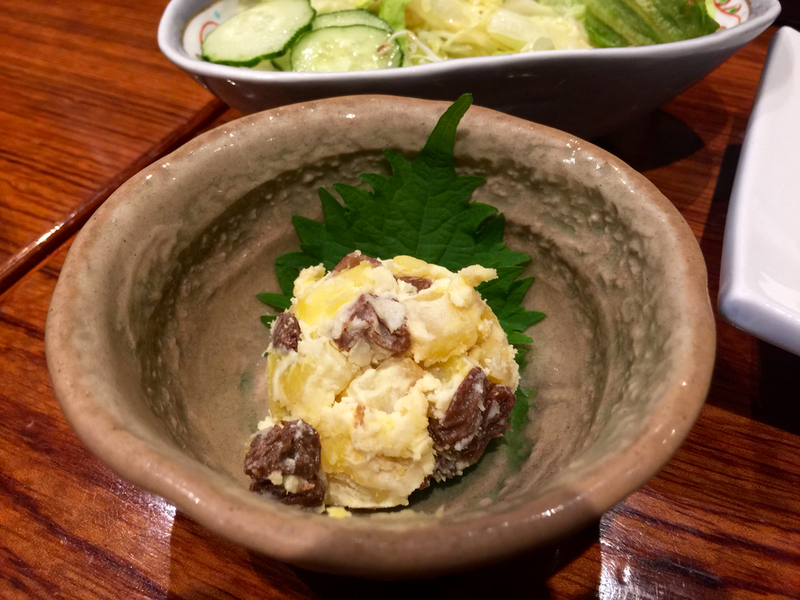 Kawagoe is well known for its sweet potatoes so it was great to try some sweet potato salad in addition to the croquettes. 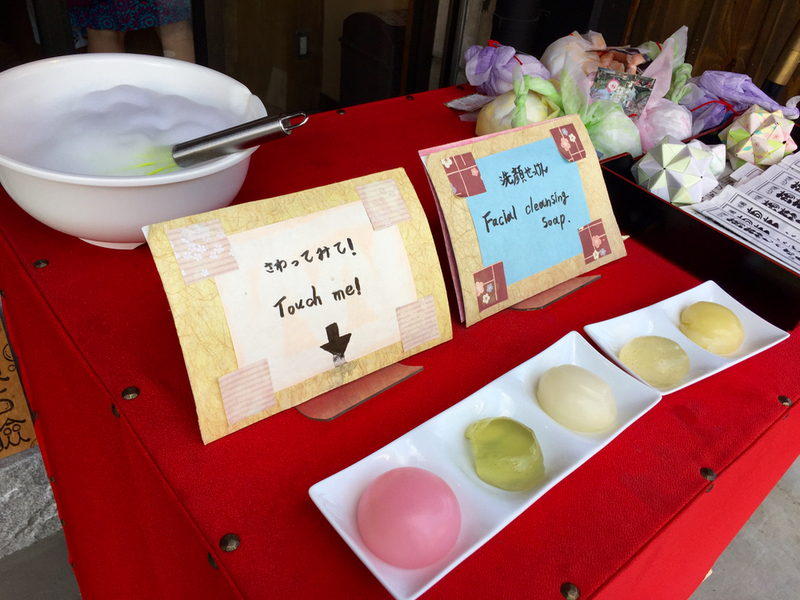 For dessert we had chilled jelly-like green tea warabi mochi and red bean paste which was perfect for a hot summer day. 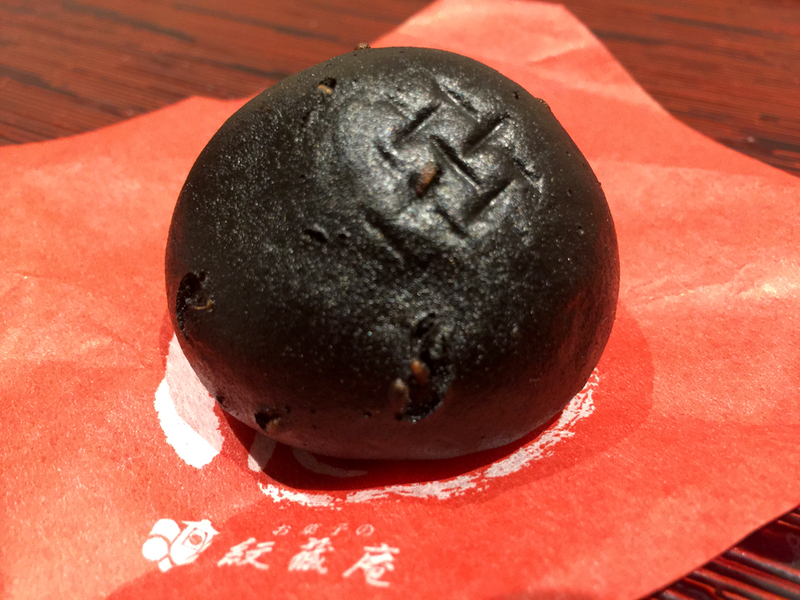 They also gave us a brown sugar karinto flavored steamed manju bun with a sweet potato filling as a snack. 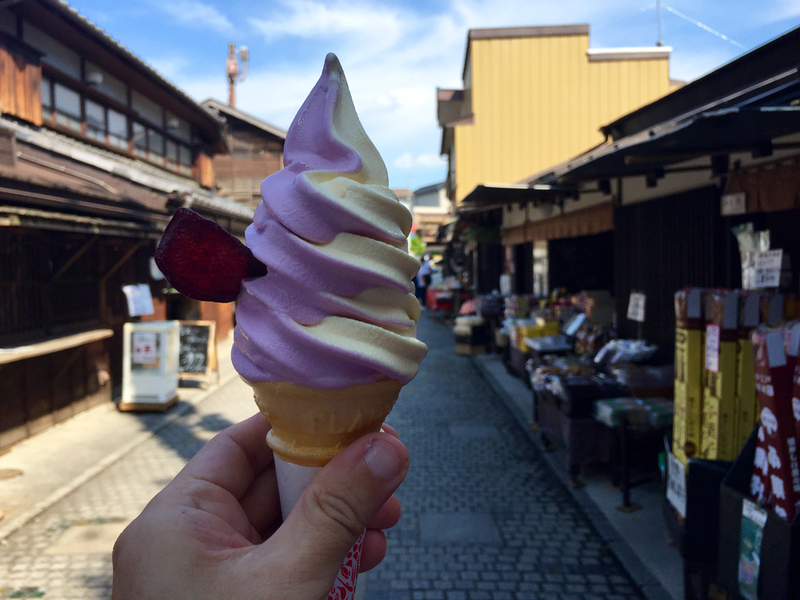 It was in a small bag for us to take home or eat on the way to our next destination. 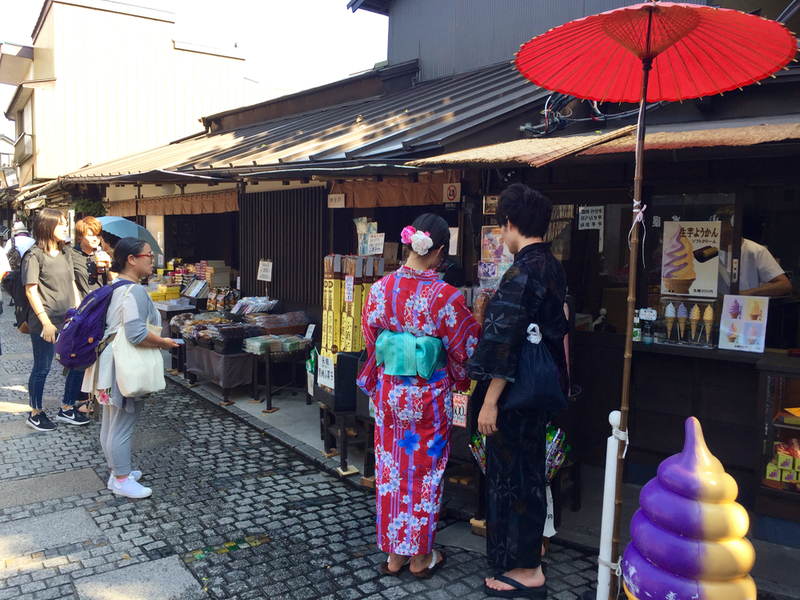 Once we were finished eating, we were free to wander around the surrounding area including exploring the souvenir shop next door. 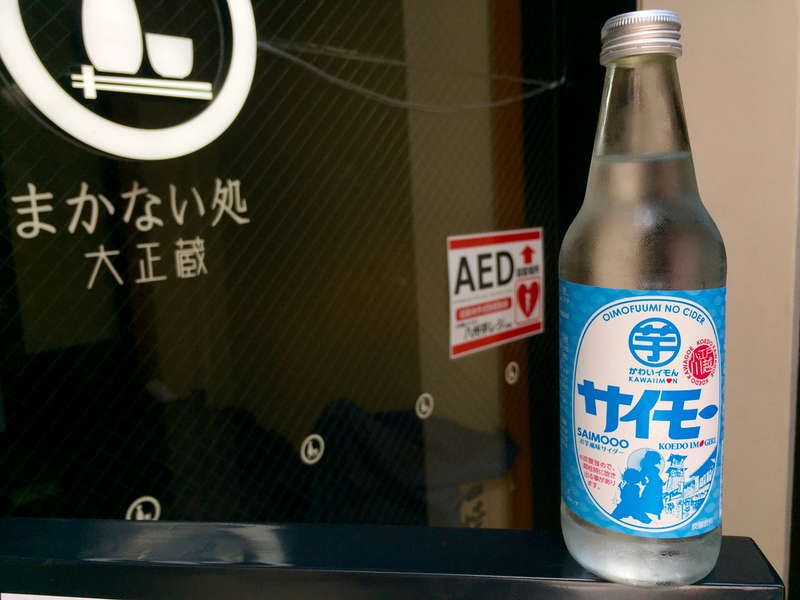 Among the many things that can be purchased in the shop were a sweet potato flavored soda. 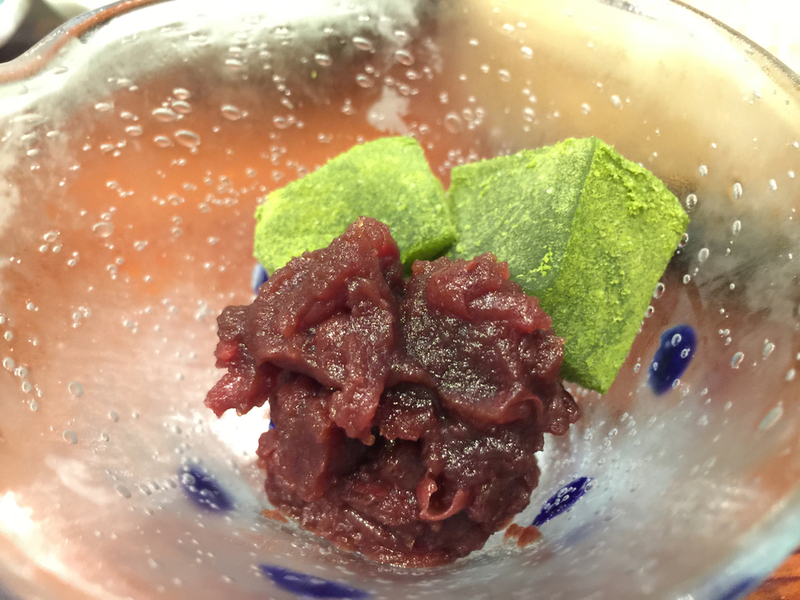 You can taste and smell a hint of sweet potato. 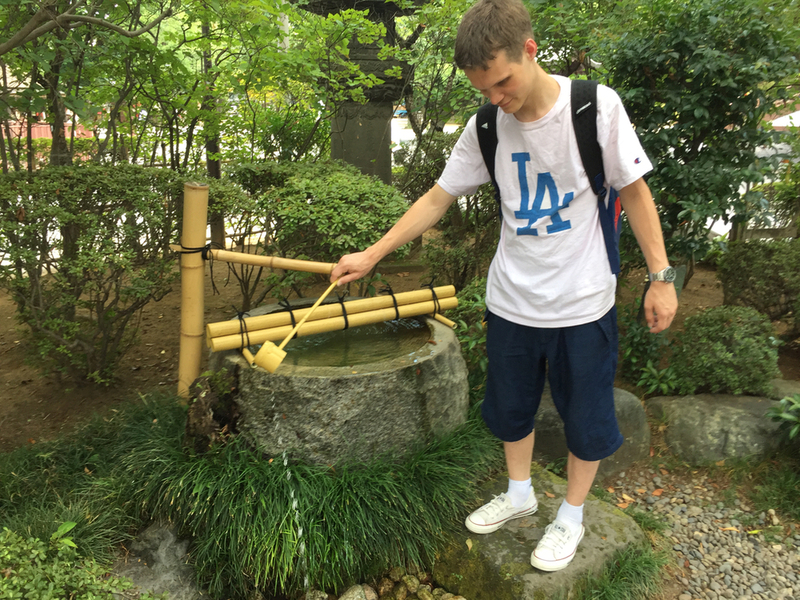 It was important to stay hydrated all through out the walking tour so this was one of the many drinks that were fun to try during the trip. 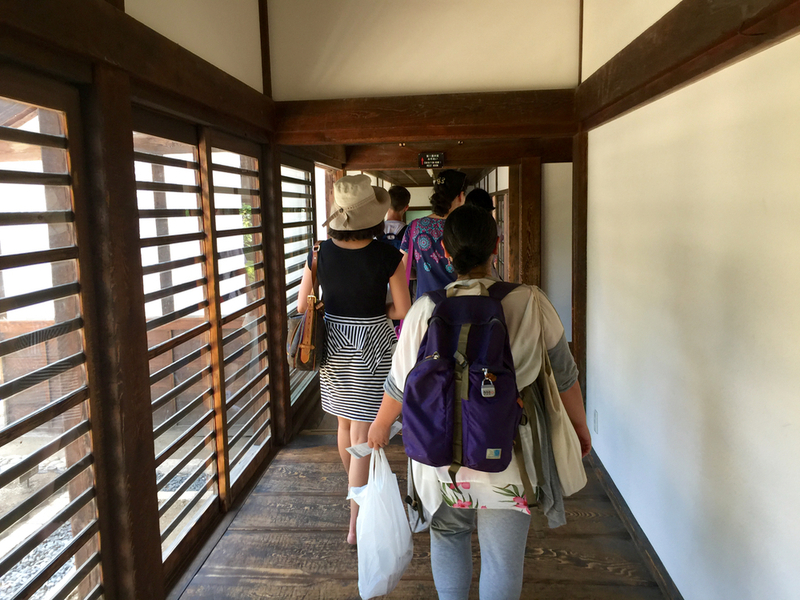 After our lunch break we regrouped and headed towards the bus that took us to the 1,200 year old Kita-in temple. The bus stop was just a few steps away. 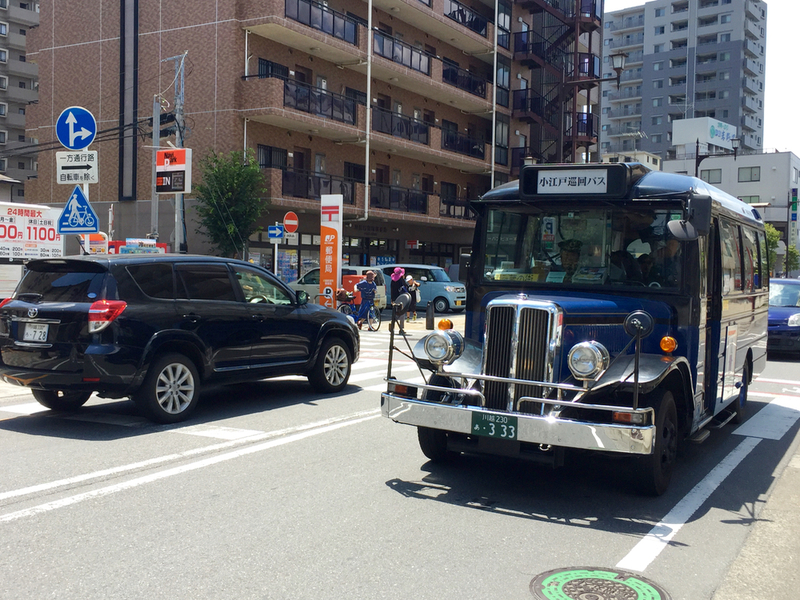 Our tour guide gave us an one day pass and with that we rode on this retro bus for about 10 minutes which took us to the temple. 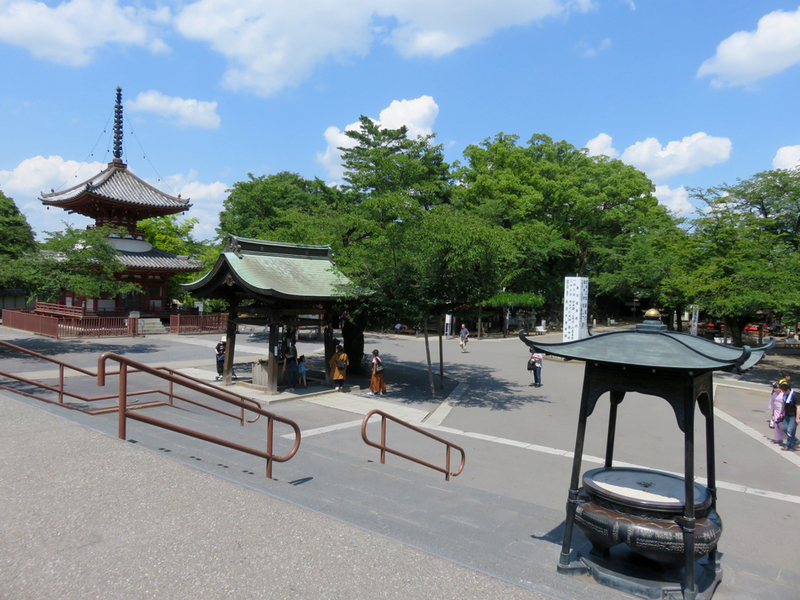 A Buddhist temple which is believed to have been founded in 830. 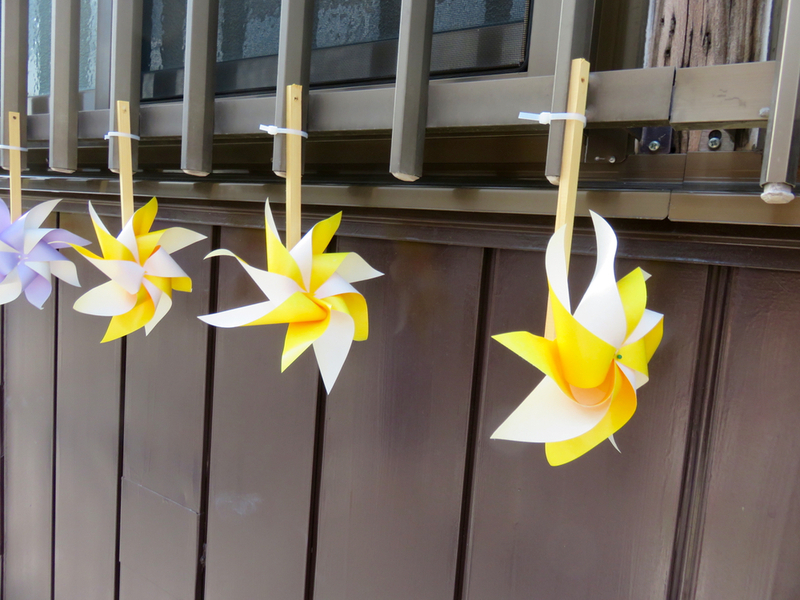 It was patronized by the first three Tokugawa shoguns Ieyasu, Hidetada, and Iemitsu. 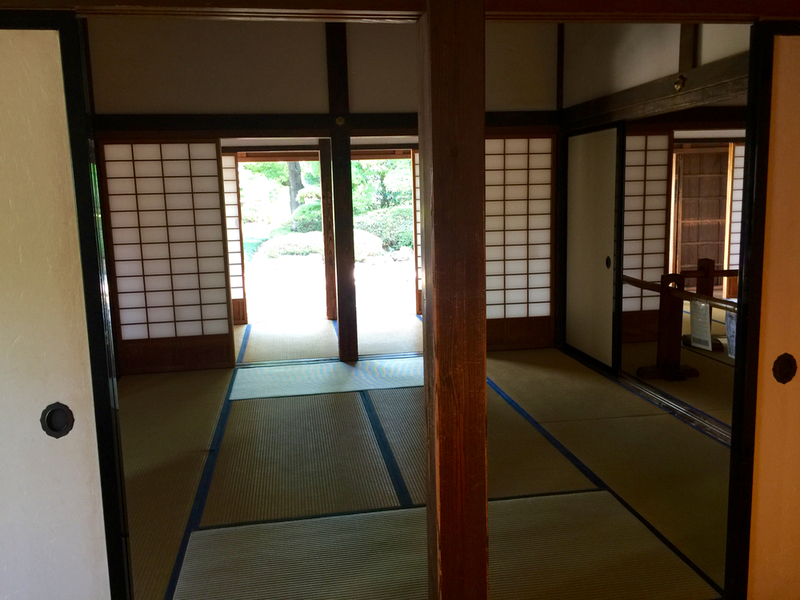 These structures contain the reception rooms, study, kitchen, toilet and bathroom that Iemitsu used, as well as the actual room where Iemitsu is believed to be born in. 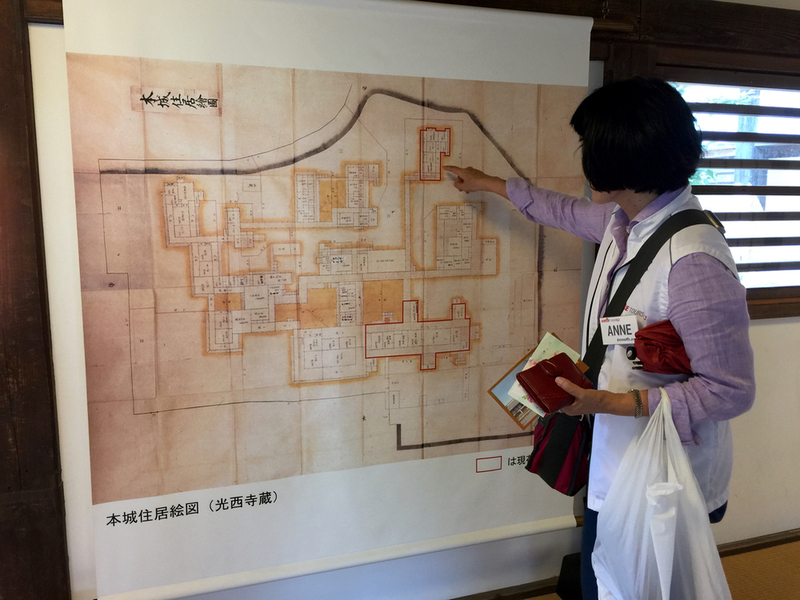 Also contained is the dressing room used by his wet-nurse Kasuga no Tsubone who became mistress of the inner palace of Edo Castle. 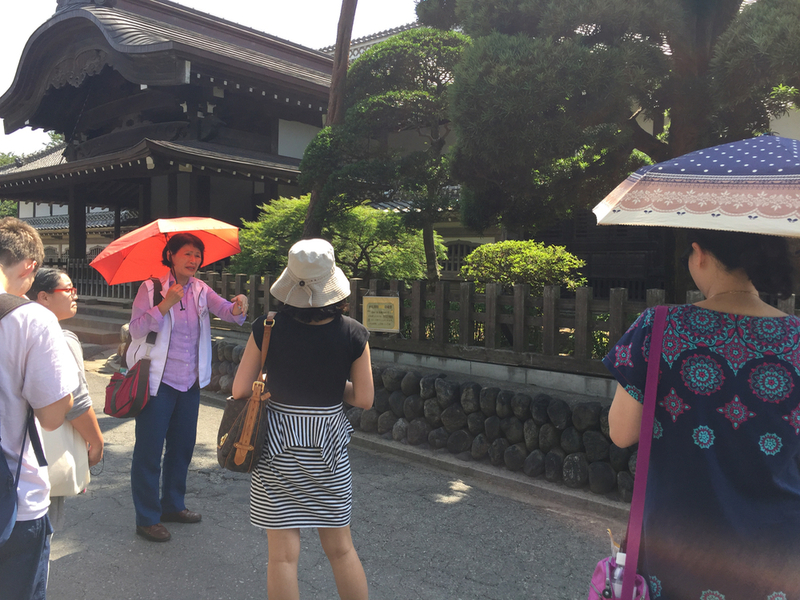 Inside the grounds of Kita-in Temple, our tour guide explained what a suikinkutsu (水琴窟) was. 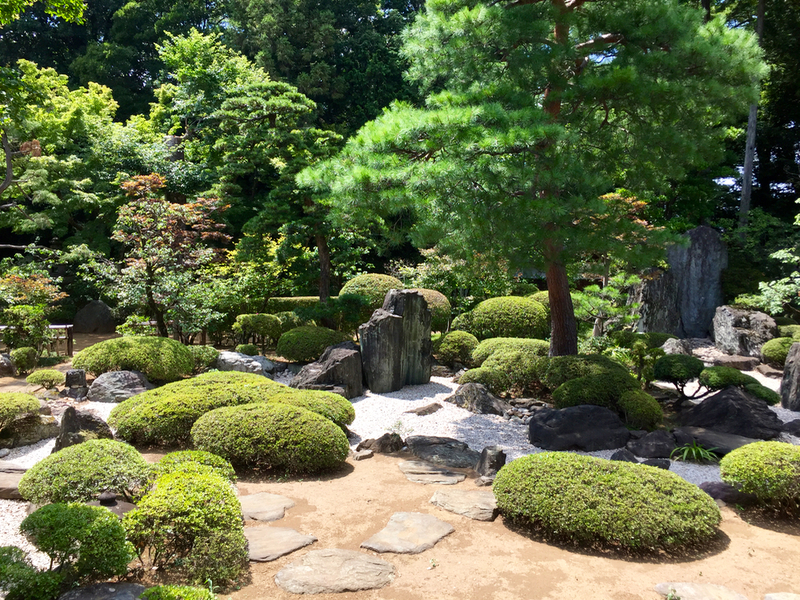 If you just look at it, it simply looks like a Japanese garden ornament. 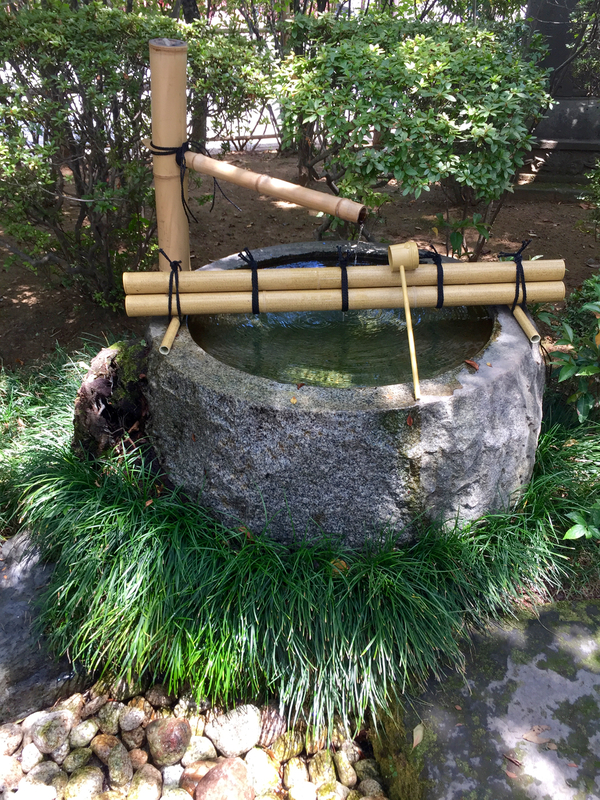 However, if you pour water on top of the rocks which actually covers a hole, you can hear beautiful sounds made from a buried pot. 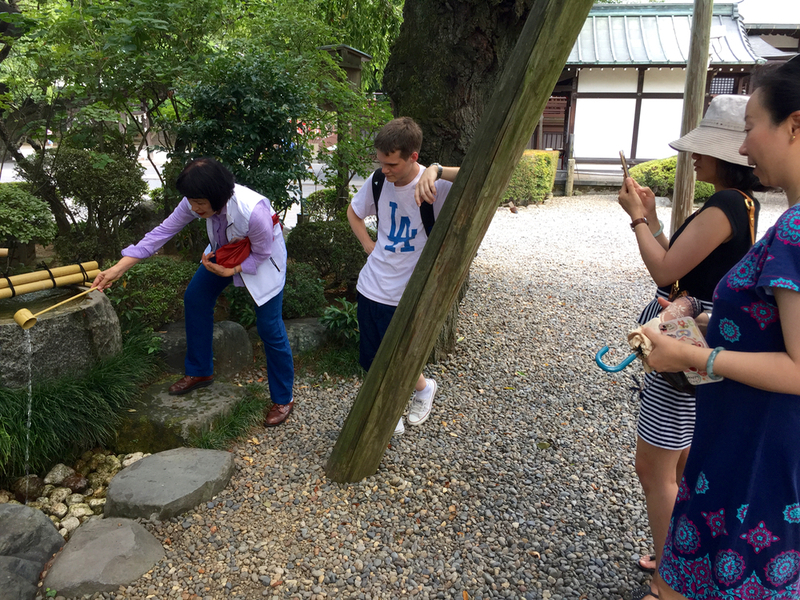 It was moments like these where extra explanations from the tour guide made the trip informative and enjoyable. Otherwise we might have missed this hidden highlight all together. 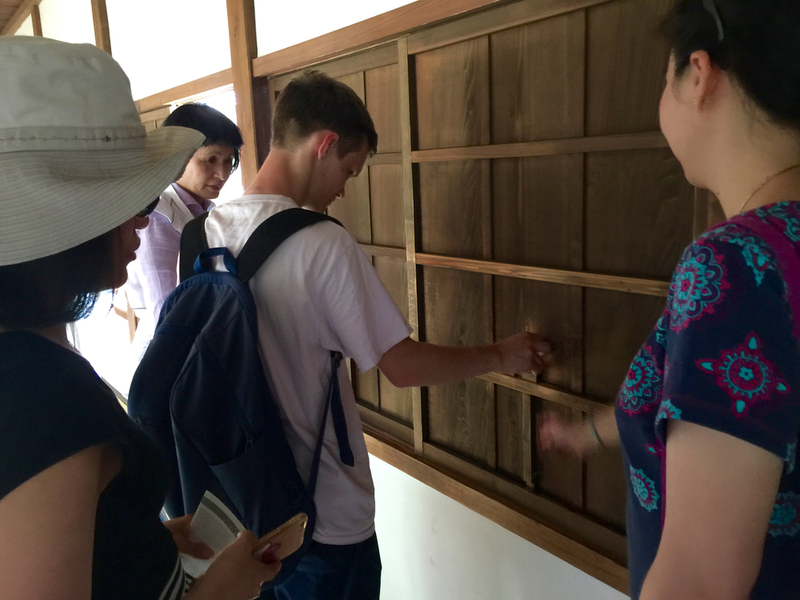 We were enjoying hearing the soothing sounds coming from the suikinkutsu so much, that our guide was nice enough to go ahead and buy our temple entrance tickets for us while we were taking our time. 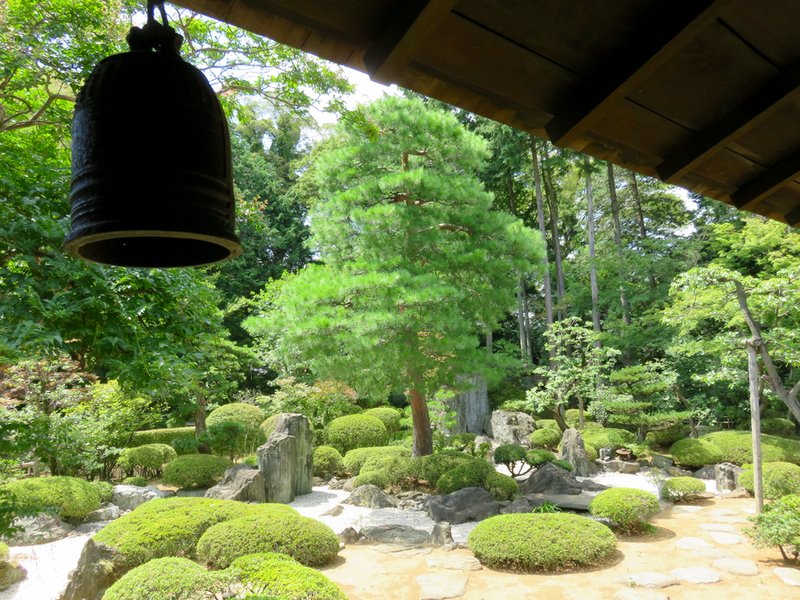 Once we entered the temple photography inside the rooms was prohibited so we took opportunities to take photos of the gardens outside. 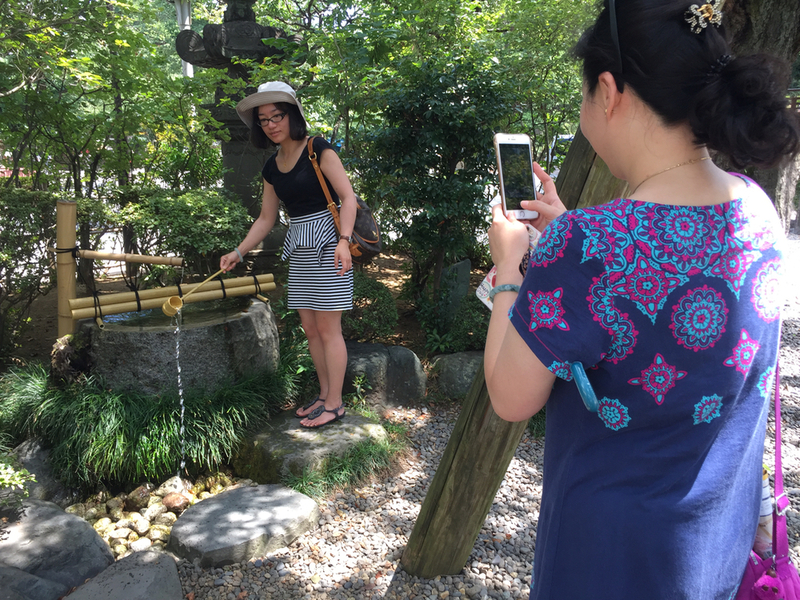 Once outside the temple, we headed towards the Five Hundred Statues of Rakan (羅漢, arhat) which is part of the temple grounds. 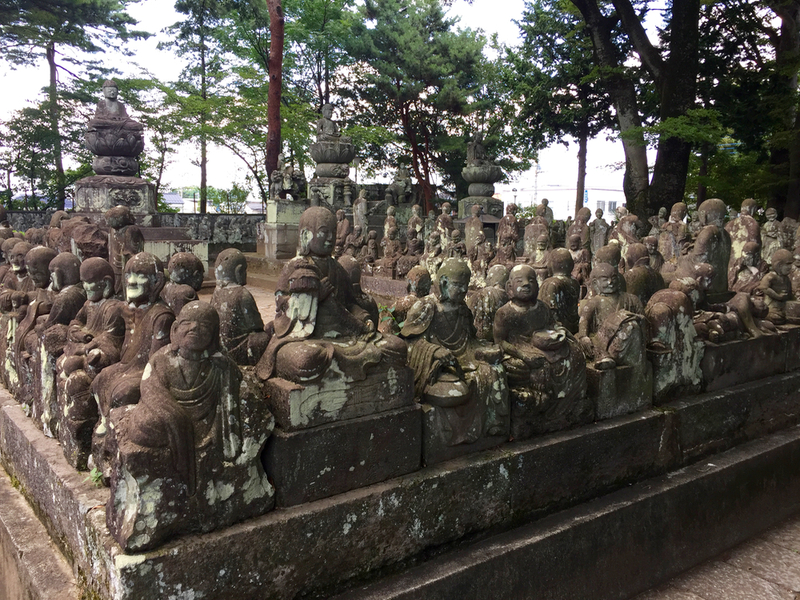 There are actually 540 statutes, all representing the disciples of Buddha. 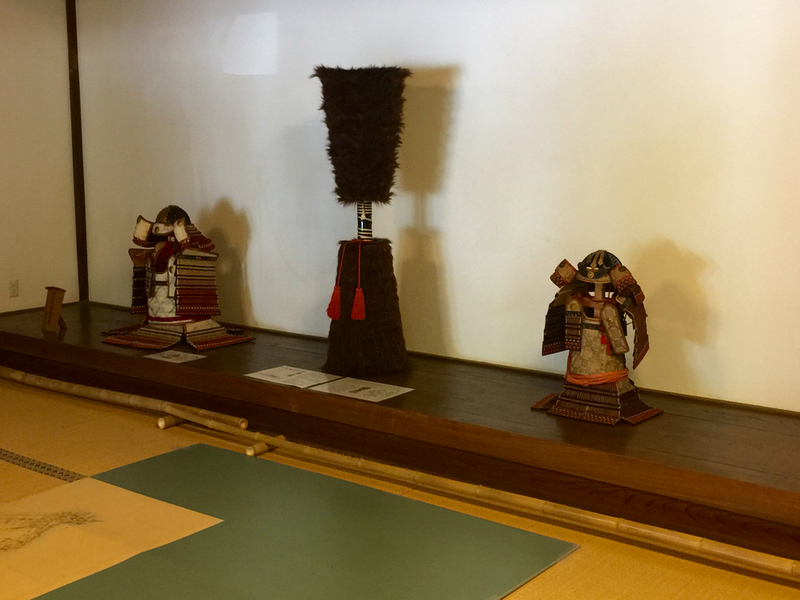 Each has a different facial expression so it is fun to observe these details and maybe find one that resembles yourself. 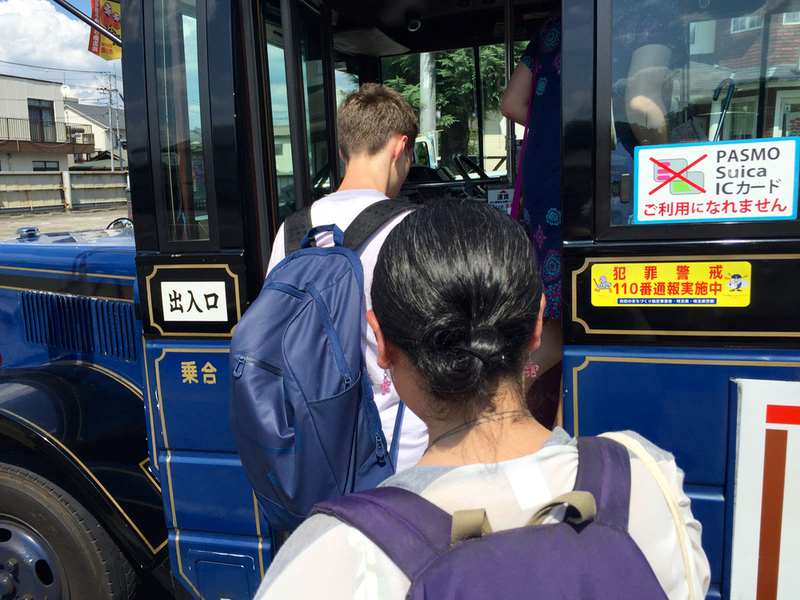 After relaxing a bit at the temple we hopped back onto the retro bus again to our next destination, Kawagoe Castle. Founded in 1457 and demolished in 1870. 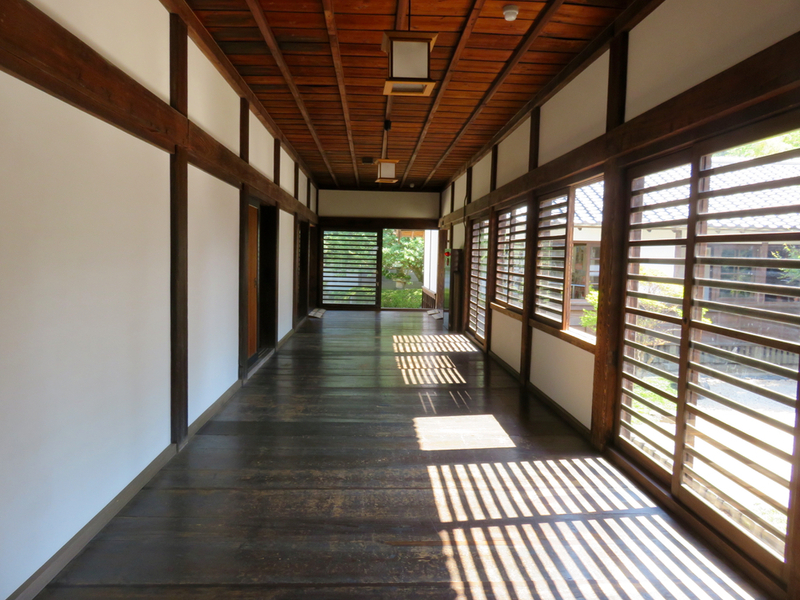 Today part of the primary hall (本丸御殿, Honmaru Goten) still remain on the original site. 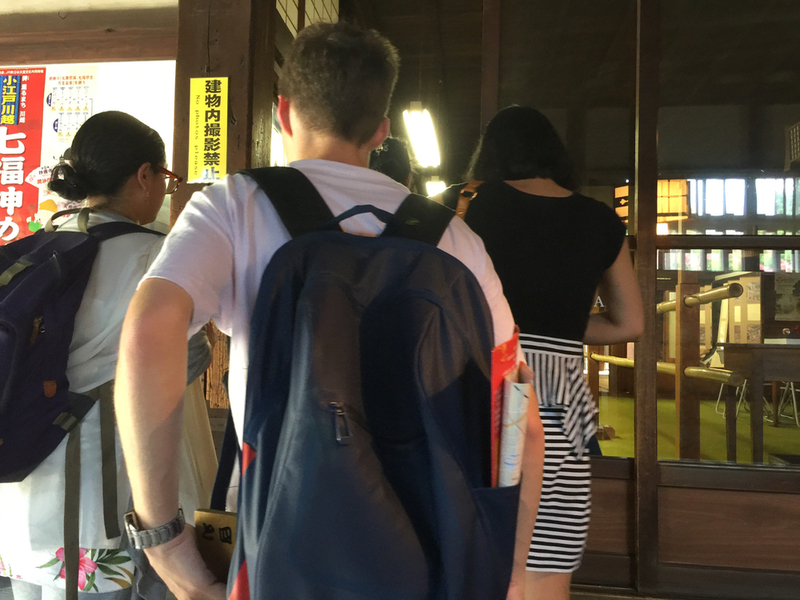 We entered the primary hall. 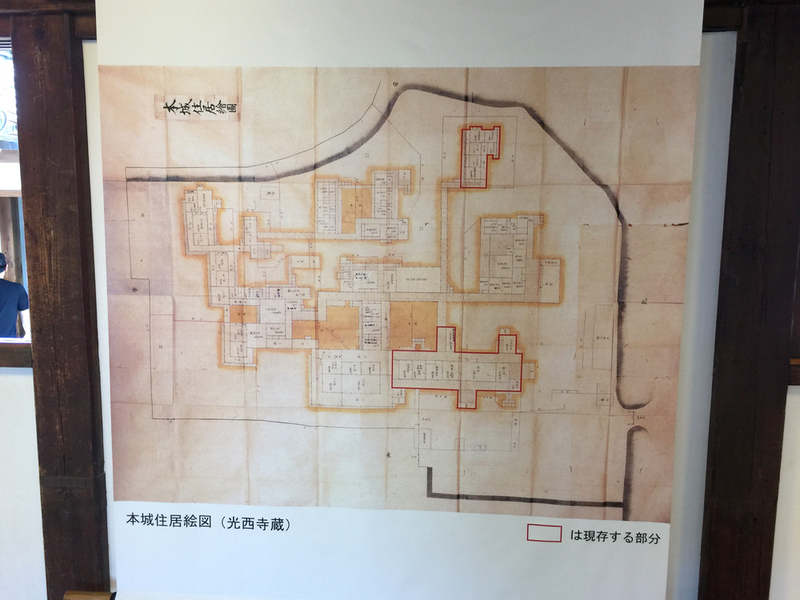 A map of the original Kawagoe Castle grounds. 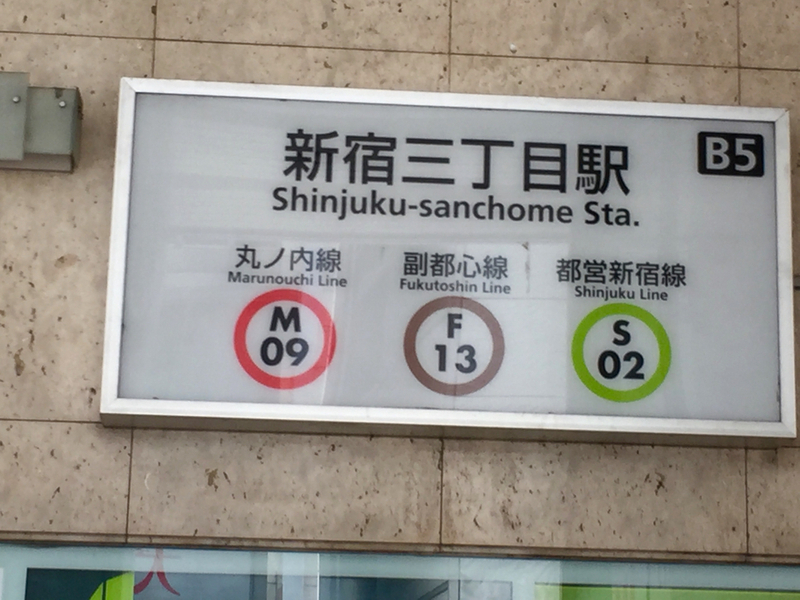 Only the parts marked by red lines remain. 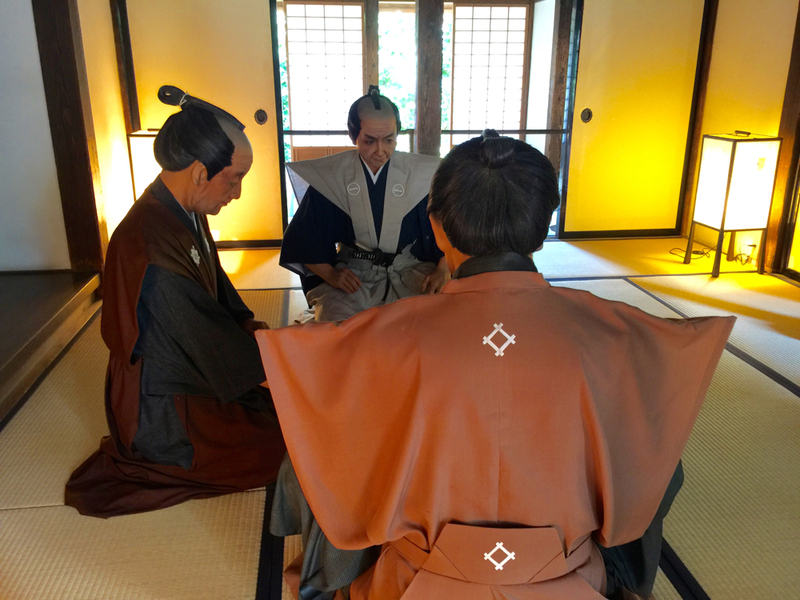 Models of a feudal lord and vassals illustrating how a discussion might have been held in the tatami rooms. Surprisingly these models helped to create a few moments where we bonded through laughter with other tour groups visiting the castle. 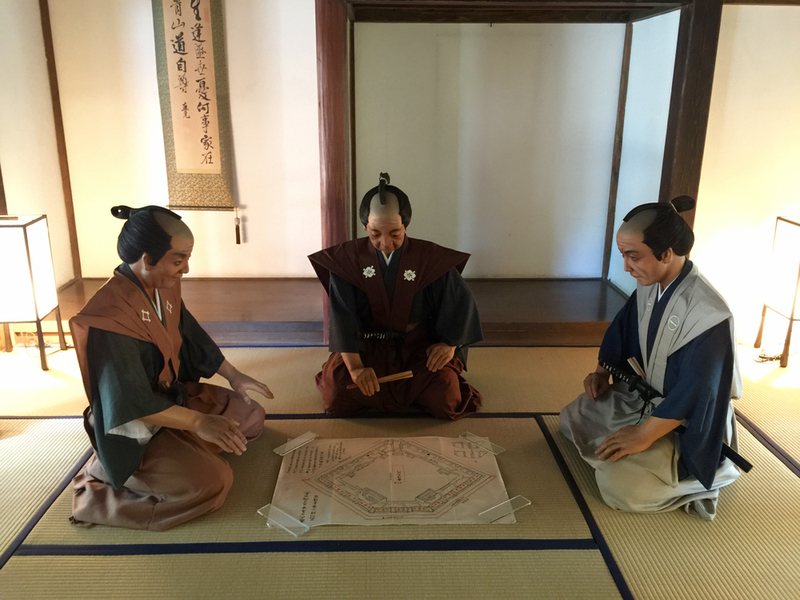 It was fun to see a few visitors laugh from being surprised for a few seconds by the display thinking they were real people. 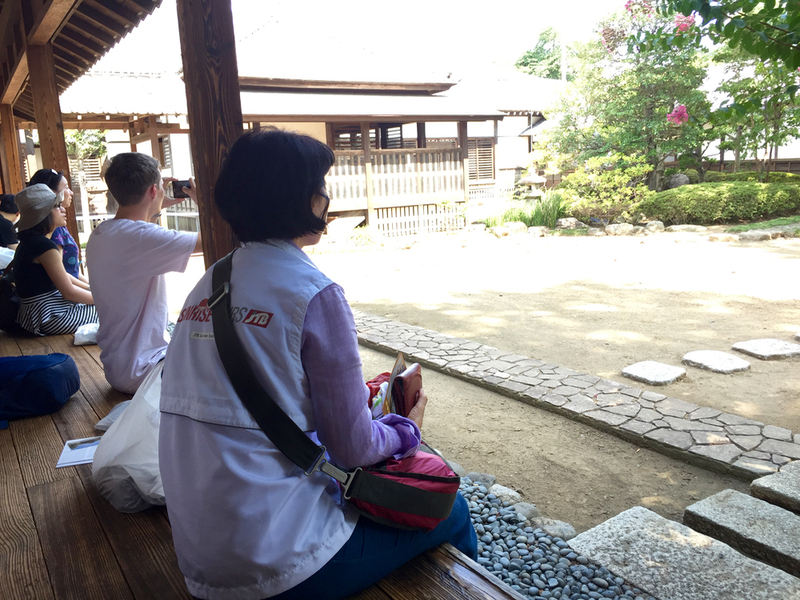 We stopped to take a break inside the castle. 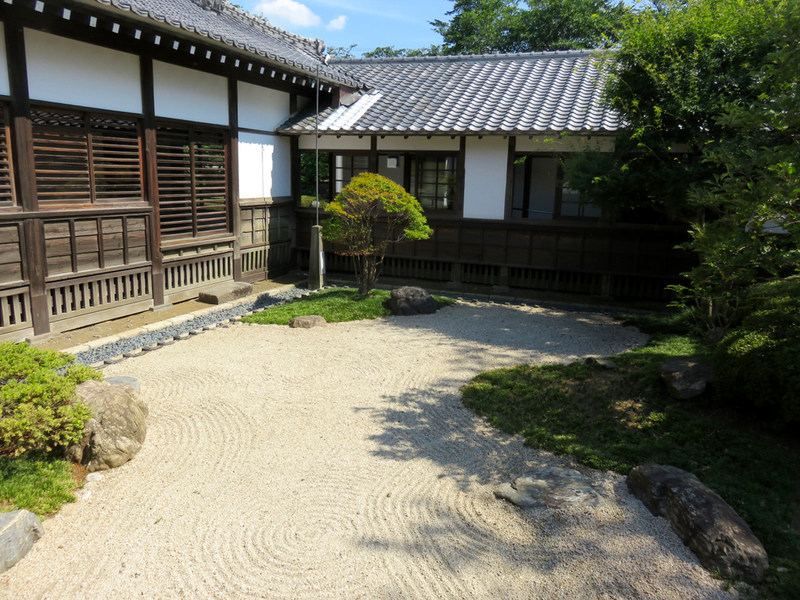 The beautiful garden and cool breeze made it a perfect place to relax. 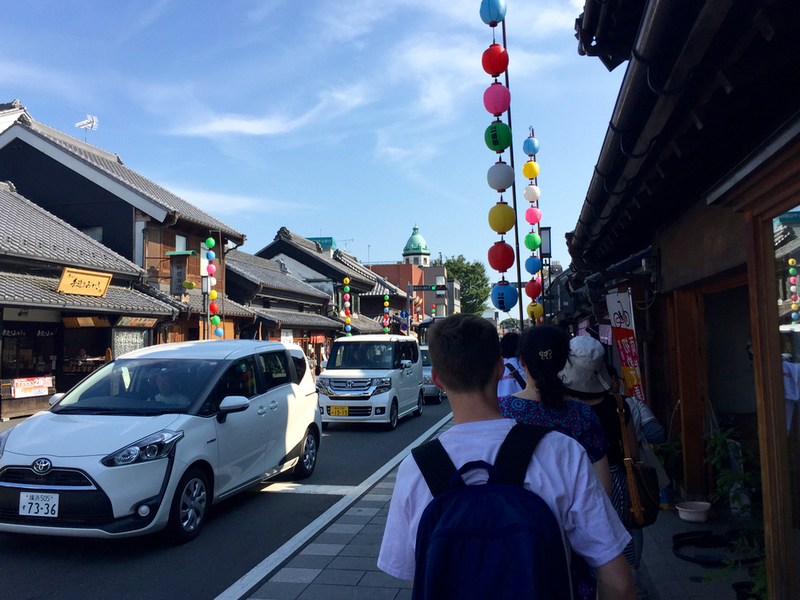 After touring the rest of Kawagoe Castle, we headed by bus to Kashiya Yokocho (菓子屋横丁) or Sweets Shop Alley lined with small candy stores selling traditional Japanese sweets. 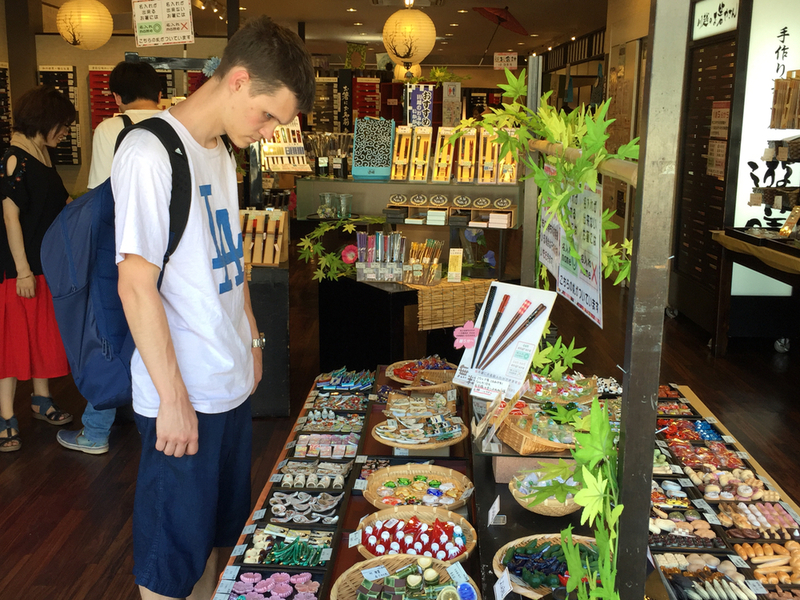 There are 22 candy shops on both sides of a beautiful stone-paved street. 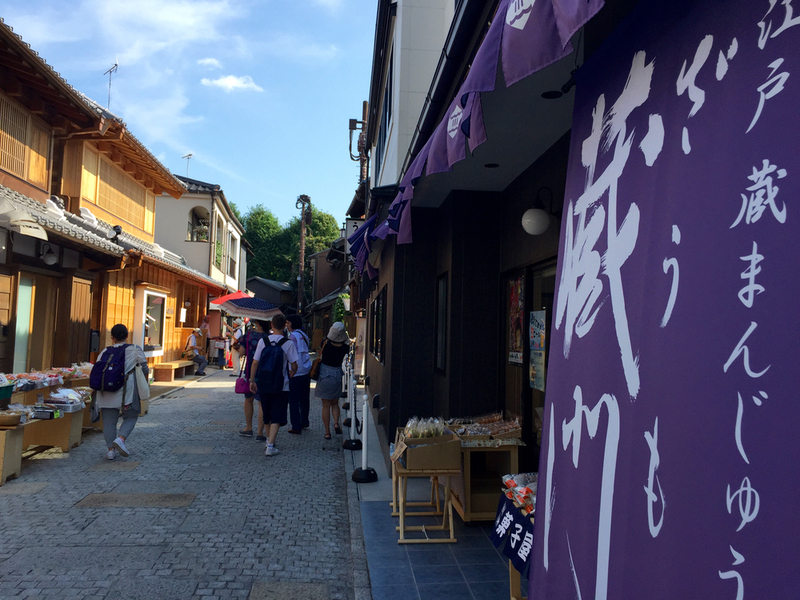 After exploring the stores a bit, we walked a few minutes to the main street. 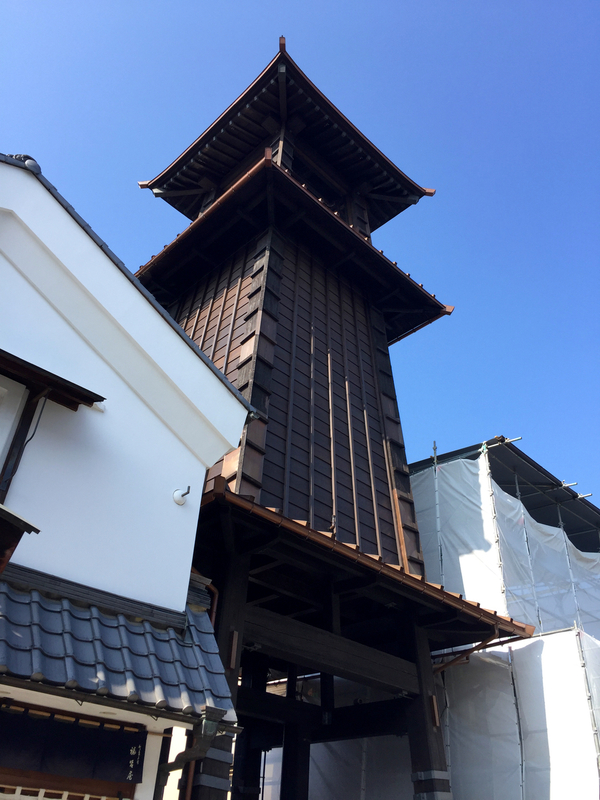 After a few steps we saw the symbol of Kawagoe, The Bell of Time clock tower. 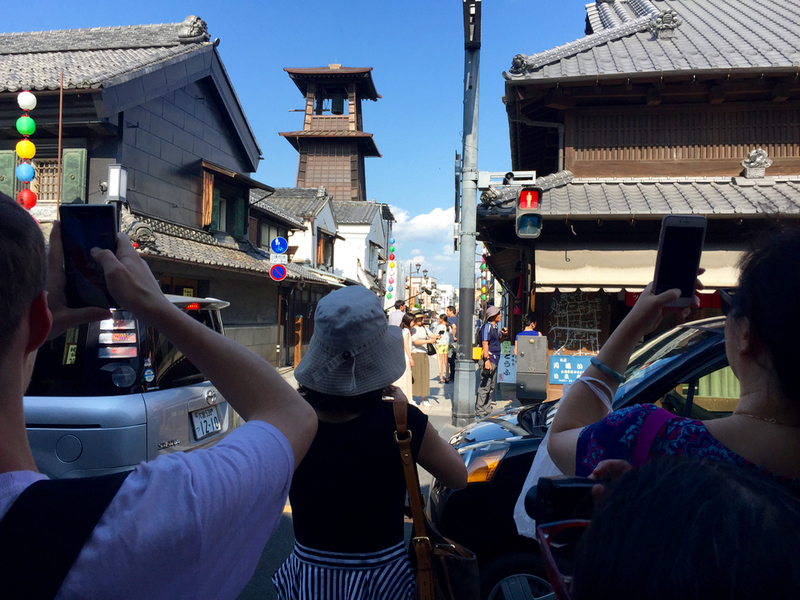 It was first built around 400 years ago, and the current tower has remained since 1894. 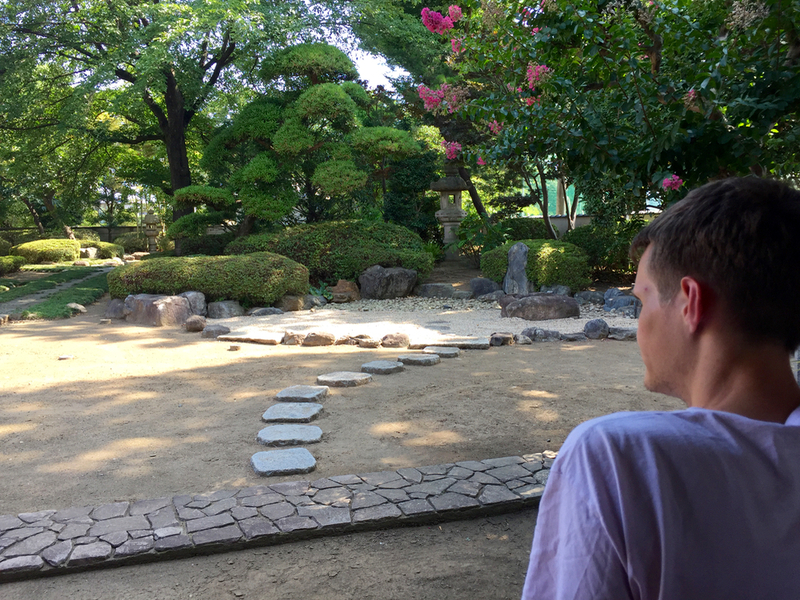 After that we had about an hour of free time to explore the area. 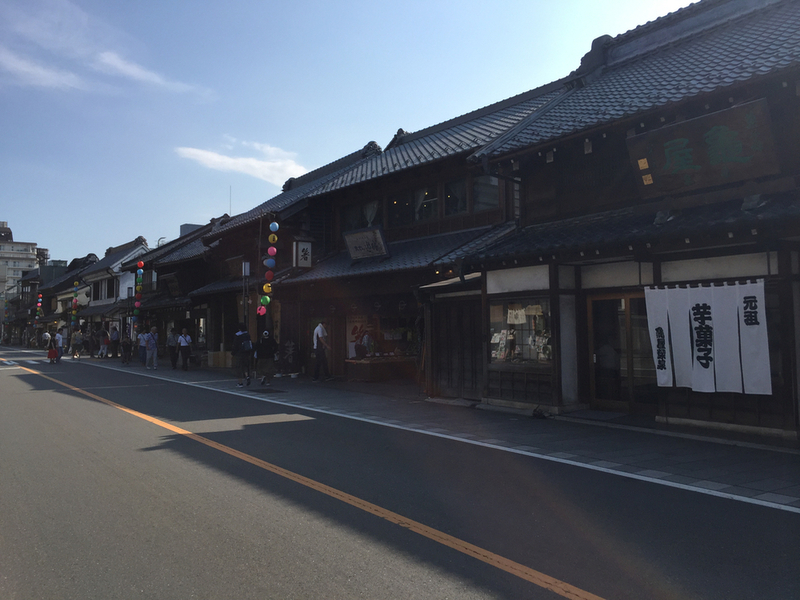 Since the storehouse-style buildings have been converted to shops, restaurants, and cafes, there were many ways to enjoy our time there. 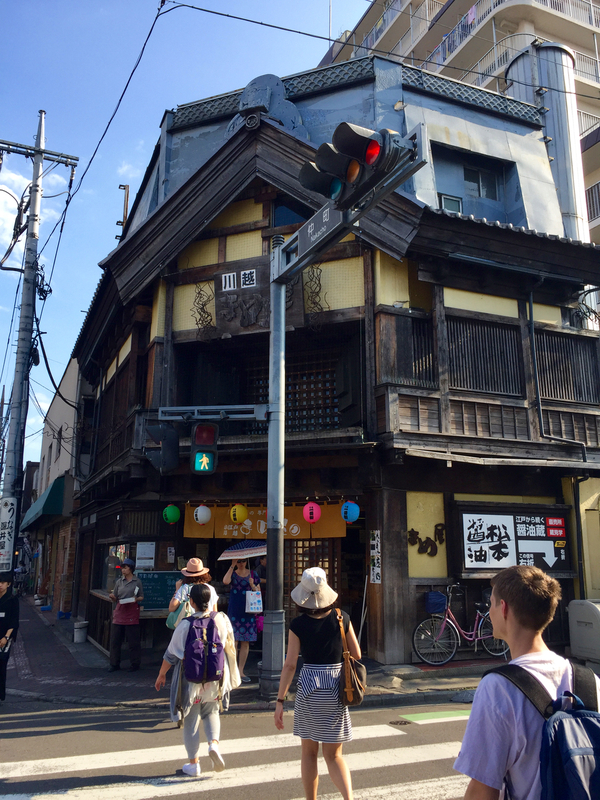 We regrouped in front of this building which was built in 1918. 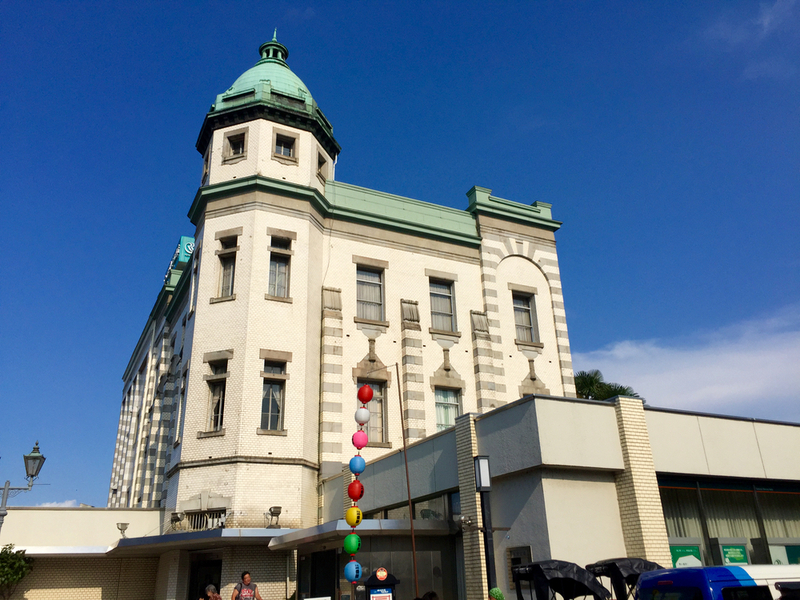 This was actually the first bank in Saitama Prefecture. 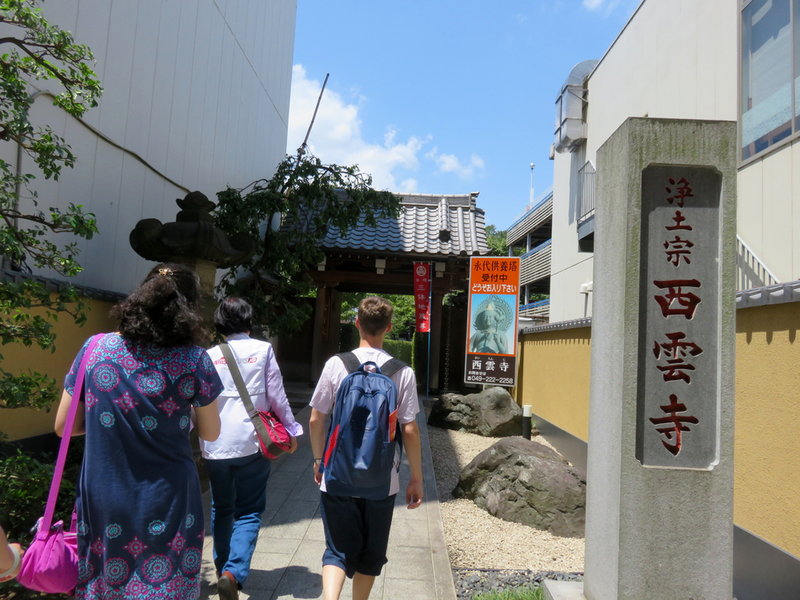 Then we walked towards Hon-Kawagoe Station while stopping by temples and shops. 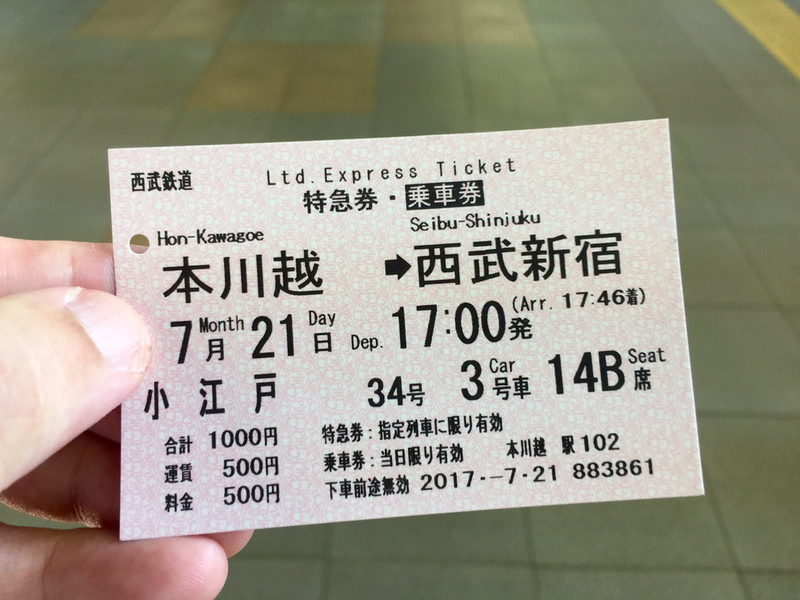 In the morning on the way to Kawagoe we took the commuter trains which was a nice experience, but on the way back it was great to relax on the nonstop express train to Seibu-Shinjuku Station.